Providing you the best range of loperamide hydrochloride capsules 2 mg, octreotide injection 100mcg, bacillus clausii spores suspension, octreotide injection 50mcg and saccharomyces boulardii 250 mg with effective & timely delivery. Loperamide hydrochloride capsules 2mgLoperamide hydrochloride capsules are indicated for the control and symptomatic relief of acute nonspecific diarrhea and of chronic diarrhea associated with inflammatory bowel disease. 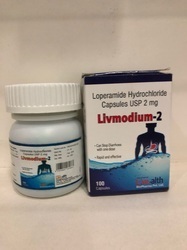 Loperamide hydrochloride capsules are also indicated for reducing the volume of discharge from ileostomies.Packing: 100 Capsules in a jar with printed carton. Packaging Details: 100 Capsules in a Jar with printed carton. 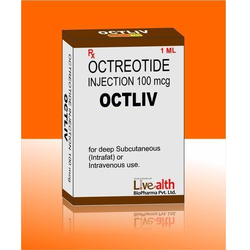 Octreotide is used to treat severe watery diarrhea and sudden reddening of the face and neck caused by certain types of tumors (e.g., carcinoid tumors, vasoactive intestinal peptide tumors) that are found usually in the intestines and pancreas. The symptoms occur when these tumors make too much of certain natural substances (hormones). This medication works by blocking the production of these hormones. By decreasing watery diarrhea, octreotide helps to reduce the loss of body fluids and minerals. Octreotide is also used to treat a certain condition (acromegaly) that occurs when the body makes too much of a certain natural substance called growth hormone. Treating acromegaly helps reduce the risk of serious problems such as diabetes andheart disease. Octreotide works by decreasing the amount of growth hormone to normal levels. Probiotic. Bacillus clausii is an aerobic, spore-forming bacterium that is able to survive transit through the acidic environment of the stomach and colonize the intestine even in the presence of antibiotics (Duc et al 2004). 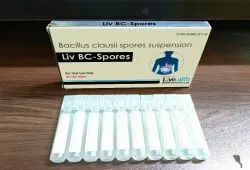 B. clausii is available for oral use as a suspension of 2 billion spores per 5 mL. 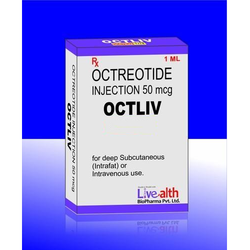 Octreotide is used to treat severe watery diarrhea and sudden reddening of the face and neck caused by certain types of tumors (e.g., carcinoid tumors, vasoactive intestinal peptide tumors) that are found usually in the intestines and pancreas. The symptoms occur when these tumors make too much of certain natural substances (hormones). This medication works by blocking the production of these hormones. By decreasing watery diarrhea, octreotide helps to reduce the loss of body fluids and minerals.Octreotide is also used to treat a certain condition (acromegaly) that occurs when the body makes too much of a certain natural substance called growth hormone. Treating acromegaly helps reduce the risk of serious problems such as diabetes andheart disease. Octreotide works by decreasing the amount of growth hormone to normal levels. 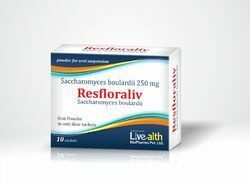 Saccharomyces boulardii is a yeast, which is a type of fungus. Saccharomyces boulardii was previously identified as a unique species of yeast, but is now believed to be a strain of Saccharomyces cerevisiae (baker's yeast). Saccharomyces boulardii is used as medicine. Saccharomyces boulardii is used for treating and preventing diarrhea, including infectious types such as rotaviral diarrhea in children, diarrhea caused by gastrointestinal (GI) take-over (overgrowth) by “bad” bacteria in adults, traveler's diarrhea, and diarrhea associated with tube feedings. It is also used to prevent and treat diarrhea caused by the use of antibiotics. Saccharomyces boulardii is also used for general digestion problems, irritable bowel syndrome (IBS), inflammatory bowel syndrome (IBD, Crohn's disease, ulcerative colitis), Lyme disease, a bowel disorder called relapsing Clostridium difficilecolitis, and bacterial overgrowth in short bowel syndrome. Some people use Saccharomyces boulardii for lactose intolerance, urinary tract infections (UTIs), vaginal yeast infections, high cholesterol levels, hives, fever blisters, canker sores, and teen-age acne.